You*ll know you*re some place special when you check into Hampton Inn - Suites Manchester-Bedford an ideal choice among hotels in Bedford NH. 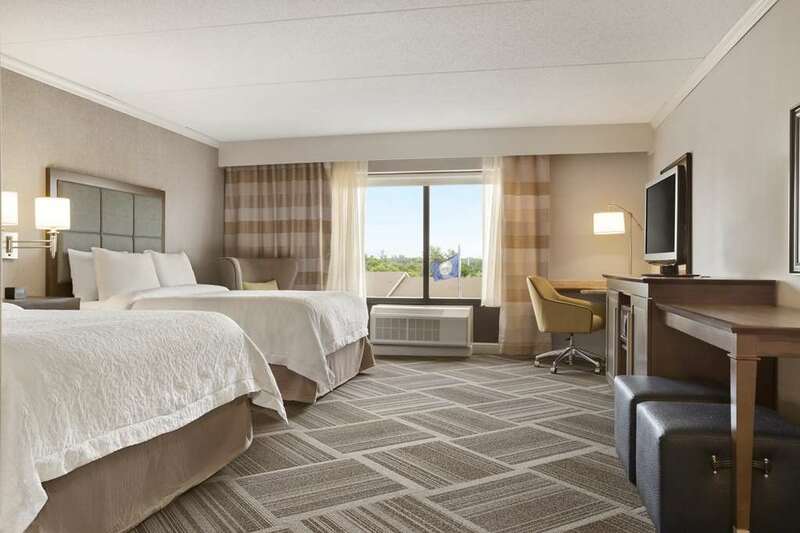 Conveniently located near the Manchester-Boston Regional Airport our welcoming hotel offers the perfect base to relax and unwind. This modern Bedford hotel is surrounded by a number of towns including Merrimack New Boston Manchester Milford Amherst Salem and Londonderry. Enjoy easy access to institutions and attractions such as Elliot Hospital Saint Anselm College Southern NH University BAE Systems Canobie Lake Park and local skiing amenities. Catch the latest movie on the big screen at the IMAX theater and cheer on the New Hampshire Fisher Cats or enjoy a concert at SNHU Arena /formerly Verizon Arena/. You will enjoy tax-free shopping at stores including Merrimack Premium Outlets Bedford Mall and the Mall of New Hampshire. We offer convenient amenities in your warm and inviting guest room. Take advantage of our complimentary hotel shuttle to and from the Manchester-Boston Regional Airport. Stay connected with free WiFi access. Listening to your favorite music is easy by pressing one of the preset buttons on your room*s alarm clock. In the evenings settle down for the night in our clean and fresh Hampton bed. Maintain your workout routine in the fitness room take a relaxing swim in our indoor pool and start your day right with Hampton*s free hot breakfast.